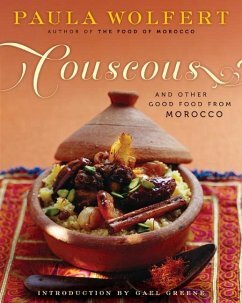 Since it was first published in 1973, "Couscous and Other Good Food from Morocco" has established itself as the classic work on one of the world's great cuisines. From the magnificent bisteeyas (enormous, delicate pies composed of tissue-thin, buttery layers of pastry and various fillings) to endless varieties of couscous, Paula Wolfert reveals not only the riches of the Moroccan kitchen but also the variety and flavor of the country itself. With its outstanding recipes, meticulous and loving research, and keen commitment to the traditions of its subject, this is one of the rare cookbooks that are as valuable for their good reading as for their inspired food.